Certified organically grown foods cannot legally contain GMOs. Limit purchases of packaged foods. Of course organic, extra virgin olive oil, virgin coconut oil, sea salt, butter, yeast for baking bread, raw apple cider vinegar, and the like must be packaged. But be aware that only 70% of ingredients are required by law to be organic in products labeled "made with organic ingredients." If you purchase a packaged product make sure each ingredient is listed individually as organic; otherwise they are not. Some organic products may list many ingredients with one or two not shown as organic that may be GMO. If a non-organic packaged product has a list of ingredients, you can likely count on at least one of the ingredients being GE. Be aware also that there are countless hidden GMOs in processed foods not certified organic or labeled non-GMO. Again, it is best to consume certified organic, fresh, whole foods as they were created and designed for our bodies for maximum utilization. Best is to grow as much as possible in your own organic garden, flower bed, or containers, using organic seeds. Most processed, fabricated foods (packaged) contain corn, soy, canola, or cottonseed oil, or ingredients made from The Big 4. (Many nutritional supplements contain non-organic soy oil.) Look for corn oil and corn syrup; modified corn starch, and sugars dextrose, fructose, and glucose. Soy products may contain soy lecithin, isoflavones, oil, protein, and isolates. Canola oil may sometimes be labeled as rapeseed oil. Stickers and labels on fruit and some vegetables can be difficult to remove. A paring knife gently slipped under the plastic labels with the side of your thumb on top of the label and overlapping the knife, then lifted gently so as not to tear the peel away before a brief soak in grapefruit seed extract water solution and rinse, works well. But before purchasing fresh plant foods with these stickers, be sure to read the numbers. Four numbers in the PLU informs us that the fruit or vegetable was grown conventionally with pesticide applications, etc..
Five numbers in the code with a beginning number of 8 alerts us that this is a GMO fruit or vegetable. Five numbers beginning with 9 in the PLU code is what we are looking for – assurance that the food is organic, and is not GE. At least 50 percent of white sugar sold in the US comes from sugar beets. If you consume this very health-damaging substance, you can be fairly certain that unless the package clearly states it is certified organic or "100 percent cane sugar," it comes from GMO crops since 95% of US sugar beets are Monsanto GMO. However, GE is only part of this frightening picture---Nancy Appleton, PhD (UCLA) found 150 different diseases linked to sugar of various kinds. 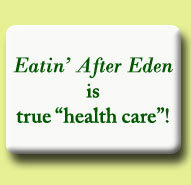 For the list, see our book, Eatin' After Eden. A word of caution: A couple of years ago we visited a local farmer's market where a young grower first told us her eggs were organic, "all natural," from pastured hens, eating nothing else but grass, bugs and worms. When it was mentioned that hens do not lay regularly without supplementing such as non-organic grain, laying mash, corn, or soy (the minimum sale to these farmers of such feeds may be a ton, and the cost is prohibitive), the farmer confessed that indeed the eggs were not organic. It's important to know your source since otherwise the non-grass feeds may not be organic. To Your Health has a wide variety of grains for humans that are certified organic; and sprouted with proof of assay to contain low phytates, including non-gluten oats. 1 To learn what's wrong with GMOs, check out http://www.saynotogmos.org/ or Google "What's wrong with GMOs?" Also, Seeds of Deception, Jeffrey M. Smith. 2 See Chap. 7, "Why Not Soy?" 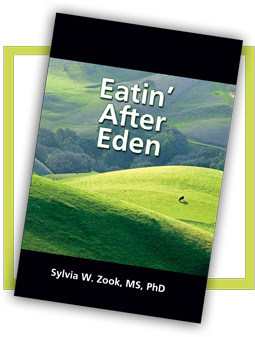 in Eatin' After Eden.